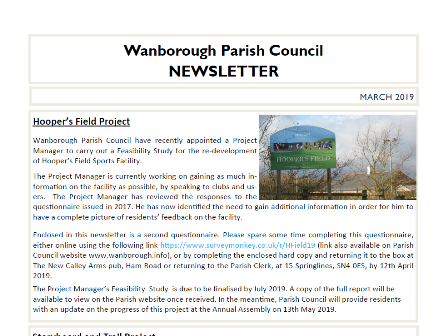 Wanborough.Info is supported by Wanborough Parish Council, to provide information about the parish. You'll find the agenda, minutes of full parish council meetings. You'll also find other interesting information about the community, local organisations, amenities, events and useful contacts. The Parish Clerk's hours are Monday to Wednesday, 9am to 4pm. 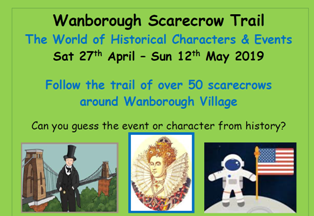 The trail will run from 27th April – 12th May 2019. 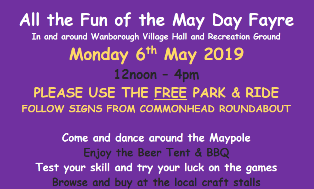 The May Day Fayre is back for 2019 on Monday May 6th! There is a new yoga class on Tuesday at Wanborough Village Hall. Parish Council Newsletter, April 2019. The next farmers' market is Saturday May 18th, 9am to midday, in Wanborough Village Hall. Final plan showing the proposed improvements to M4 Junction 15. SBC have confirmed that work is due to commence in September 2019. Although this facility is not primarily for commercial advertising, we have recently added some events at commercial venues to help to avoid clashes. Also remember that the Village Hall Page has a booking calendar which you can check before planning events.